It’s been way too long since I updated Josh’s journey. The energy moving around him right now has an awesome feel to it. We worried when the personal trainer left. I didn’t want Josh to lose ground that he’d worked so hard to gain. But God works in mysterious ways. Josh needed home help and guess who needed a part time job? One with flexible hours? You guessed it. Abbey started working for Josh and boy, does he need her. He has big changes coming into his life. At long last, we are close to finding him a voice. He had a speech evaluation earlier this month and after talking to the speech therapist, she said she could think of three systems right off the bat that would meet his needs. So, Josh will be meeting with an occupational therapist who will help him determine what sort of switches he can use and where they should be placed. Then he will meet with the speech therapist and the vendors of the systems. Josh will get to try them, talk about them, and choose one to use at home for thirty days. If that one doesn’t meet his needs he can try each of the others for thirty days before he makes up his mind. And here enters Abbey. Josh is being tutored. He’s determined to know how to spell as many words as possible. He needs to refresh him mind about sentence structure. We need to find out what he knows, where he has gaps, strengthen his academic skills. 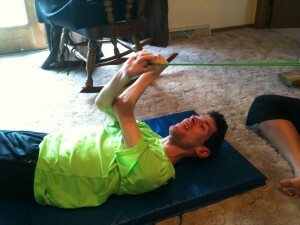 In addition to the classroom work, he’s continuing to get stronger. A bone density scan revealed osteoporosis so Josh underwent an IV treatment to help his bones get stronger. It was a bit hard on him and he ran a fever and was achy for a few days but he came through it. 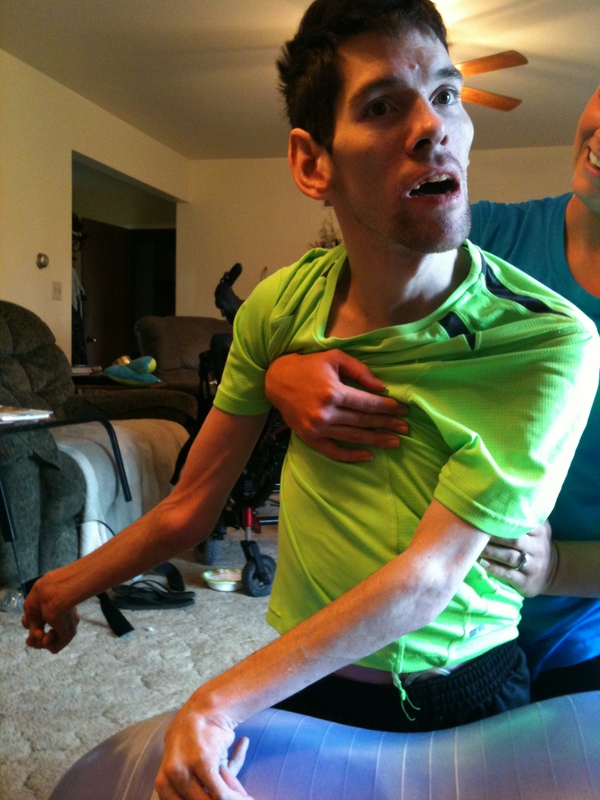 We have hope that his body will grow even stronger. He did some amazing work this week. Watching him use the resistance bands is fun. Josh is fierce and that energy coming from him gives me goosebumps to watch it. But even more than the power, I love the control. Slow, careful movements tells me he is being intentional. He held the band in his right hand. He was pulling hard, then I see the left hand move. Slowly, carefully he brought it up. As his hand came up the fingers opened and he very gently gripped the band. This is mid line work. We’ve tried for a year and a half to get him to voluntarily bring his hands to mid line. And now, we see not only his hands mid line but look at his head. That little smile on his face shows he knows he’s done something pretty amazing. He’s proud of himself. He’s putting equal pressure on the bands. I’m so glad I managed a photo of this. It’s rare and the beginning of something wonderful. I like this photo because it shows how far he’s come. We’ve seen him on his knees before but he was usually bent forward. In this one I’m seeing his hips and lower back straighter. More the position he would need if he was standing upright. He’s gained a lot of muscle to be able to hold this and he’s doing it pretty much on his own. I can’t adequately describe my emotions when I saw him do this. While in this position, he had a look of wonder in his eyes. He turned his head, very slowly and carefully, and just looked around as if everything was different. I’m hoping that his brain is making new neural pathways that will help him continue to develop control over his body. It’s been an exciting month. A wonderful week, and I’m looking forward to finally having a chance to hear what my son thinks without me guessing. I don’t care if the voice will be mechanical, I just want Josh to be able to express himself without having it filtered through somebody else. As Mae West once said, Hang on, boys. It’s going to be a bumpy ride. But man, what a ride. I can’t wait.